Dainty well balanced little dog. An alert bearing and intelligent expression. 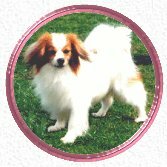 The name "Papillon" is derived from the Sharpe and position of the ears. When erect they are carried obliquely like the spread wings of a butterfly, hence the name. When the ears are completely dropped this type is known as the "Phalène" (Zo Moth). Head markings should be symmetrical, about a narrow white clearly defined blaze which is desirable but not essential to represent the body of a butterfly. Medium size, almond shaped, never bulging, dark with dark rims, placed rather low in skull. Very large, mobile with rounded tips, heavily fringed; set towards back of head far enough apart to show slightly rounded shape of skull. Leather firm but fine. When erect each ear should form an angle of approximately 45 degrees to head. Jaws strong, with perfect regular, and complete scissor bite, i.e. upper teeth closely overlapping the lower teeth and set square to the jaws. Lips thin, tight and dark in color. Shoulders well developed and sloping. Chest rather deep. Forelegs straight, slender and fine boned. Elbows close to chest. Fairly long with level top line; well sprung ribs, loin strong, of good length, slightly arched belly. Well developed, well turned stifle. Legs when, viewed from behind, parallel. Dewclaws on hind legs removed. Light, free-flowing positive and free from any restriction. Viewed from in front or behind, legs and feet moving parallel to each other, with feet turning neither in nor out. Viewed from side, dog covering ground well with no hint of hackneyed action. White with patches, which may be any color except liver. 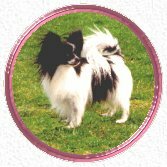 Tri-colors black and white with tan spots over eyes, tan inside ears, on cheeks and under root of tail. Height at withers, aprox: 28 cm (11 ins). Dog will appear slightly longer than high when properly furnished with ruff and hind fringes.